Man may be defined as a complexity of subatomic fields, within atomic fields, within cellular fields which make up organismal fields; these in turn exist within gravity fields, magnetic fields, electrostatic fields and light fields. Cognitive man of seven senses is dependent upon all of them. Under special circumstances, in dreams, meditations or out-of-body experiences, the “I” of man functions independently of physical being and time. Because man receives meaningful information in such states, we ponder on the origin of such information. Who can say that the fluctuations of magnetic and electrostatic fields upon the surface of our sphere are [not] indicative of a planetary consciousness? Sometimes we dimly feel the intense life which goes on in the phenomena of nature, and sense a vivid emotionality manifesting itself in the phenomena of nature which, to us, is dead. Behind the phenomena of visible manifestations there is felt the noumenon of emotions. In electrical discharges, in lightning, in thunder, in the gusts and howling of the wind, are felt flashes of sensory-nervous tremors of some gigantic organism. Psychotronic machines are devices that can be interfaced with psychically-gifted individuals to draw on and exponentially expand the psychic potential of the human mind. These devices can ostensibly pair the human psyche with such energies as microwaves to carry and amplify bioenergy. As Dennis Stacy explains in “Battle of the Minds,” in Psychic Warfare: Fact or Fiction?, American Army experiments have demonstrated the feasibility of making voices heard inside the head via microwave broadcasts. Other types of waves and frequencies can be used to conduct, amplify, entrain or remotely control the psychic power of the human mind. For instance, radionics devices have been fully operational in the U.S. for some years to cure diseases from a distance. It is my sincere desire that this enigma of radionics be studied by those well qualified investigators in the field of applied cybernetics, parapsychology, and psychotronics. Radionics appear to have much in common with the phenomena of dowsing, and/or telepathy, and it rightfully belongs to those scientific investigators in both hemispheres to pursue this research further. Here we have a concise tie-in between radionics devices, telepathy and cybernetics. This connection will prove interesting as the reader continues. Similar devices, such as psionics or Hieronymous machines, are simple devices which conduct electrical energy or bioenergy. The theory underlying radionics or psionics machines is that things like minerals, crystals, plants, microbes and diseases, essentially all organisms whether our science considers them biologically ‘alive’ or not, have their own specific vibratory rate or electromagnetic signature. The radionics specialist tunes in to the specific frequency of the bio-entities that he wishes to target and turns on the machine. The target can be miles away – it doesn’t matter where they are. These types of machines can even employ a photograph or strand of hair to capture or encode the specific wavelength signature of a person. This has an interesting similarity to remote viewing, which often contains a photograph of the target enclosed in an envelope, and the remote viewer is supposed to telepathically zoom in on the real target which the photo represents. In this way, microscopic ‘critters’ who are causing us to be ill can be specifically targeted by the device. People and animals can also be caused to become ill by the same methods. (It has been noted that viruses, such as the AIDS virus, could be attacked in this manner, but this method of treatment remains marginalized.) As an example of what could be done, a photo of a cotton field could be treated with insecticide and the psychotronic machine operator could “wish death to all boll weevils therein.” The targeted insects may not necessarily die, but may simply “get the message” and migrate to another place. Some might say that the treatment of an object having a correspondence to the target, coupled with evil intention sent via thought waves, is descriptive of the practice of voodoo. According to a personal communiqué from Judy Wall, there are three patents for the Neurophone. In a discussion with Mr. Flanagan, he told Ms. Wall that the original Neurophone, which was called a Nervous System Excitation Device (U.S. Patent #3,393,279), was developed by Flanagan when he was 14 years old. This patent was described as “a method of transmitting audio information via a radio frequency signal modulated with the audio info through electrodes placed on the subject’s skin, causing the sensation of hearing the audio information in the brain.” This patent application was filed in 1962 when Flanagan was a senior in high school, but it was not granted until July 16, 1968, because the patent examiner didn’t believe it worked as claimed. After Flanagan had gone to college and was working for the Naval Research Lab, he filed a second patent application, called Method and System for Simplifying Speech Waveforms (Patent #3,647,970), on August 29, 1968. According to this patent, “a complex speech waveform is simplified so that it can be transmitted directly through earth or water as a waveform and understood directly or after amplification.” The second patent for the Neurophone, which used transistors, was applied for immediately after the first one was granted. A government secrecy order was slapped on the second Neurophone and this patent was not issued until March 7, 1972. The third Neurophone is a modern version using solid state circuitry, combining elements from the two previous patents. Flanagan told Ms. Wall that he no longer files for patents since it’s like giving your ideas away to whoever reads it. As John White also writes in his Afterword to Psychic Warfare: Fact or Fiction?, air and space travel would be revolutionized by psychotronics. White maintains that UFO propulsion is “probably psychotronic in nature.” But what does this mean and what are the implications for human beings? As researcher Randy Koppang has concluded in The Excluded Middle (Winter 2000), the ultimate reason for the intelligence community’s interest in remote viewing is the psychic interface between human consciousness and technology, or man/machine interface. Some believe this interest stems from back-engineering projects involving captured extraterrestrial space craft. According to Col. Philip Corso’s book, The Day After Roswell, among the artifacts retrieved from the infamous 1947 Roswell saucer crash were headband devices of flexible plastic material that contained electrical conductors. Corso connected this headband artifact to the piloting of the alien space craft. As Corso has disclosed, among the technological artifacts retrieved at the Roswell crash were headband devices which contained some sort of electrical circuitry. It’s a good guess that such circuitry would be crystal-based, since crystals are a highly organized and energized living structure, which, if we consider Rupert Sheldrake’s theory of formative causation, can ‘learn new tricks.’ In any structure that is highly organized, including crystals, plants or humans, there is a series of geometric points at which the energy is highly concentrated. This relates also to chakras and acupuncture points. These ‘intelligent’ energy forms, which are unknown to current (mainstream) science, in effect bring back in from the margins the Lamarckian concept of an intelligently guided evolutionary process. Therefore, crystal electronic circuitry could be an effective bridge between mind and matter and an effective material with which to interface and extend/amplify the parameters of the human psyche, since it contains the inherent signature properties of bio-communication. Marcel Vogel, senior chemist for IBM, did extensive work in this area. An on-line article at www.stardrive.org entitled “The Starship Builders” describes NASA’s sudden interest in exotic new energy/propulsion physics. On 9/13/96, NASA announced an about-face in its program by announcing a new research program which would seek to “revolutionize” space travel by utilizing non-mainstream theories. As this article explains, a government “steering group” consisting of members from the various NASA centers, the Department of Defense, and the Department of Energy was established in 1997. At that time, an “invitation-only workshop” was to examine the relevant emerging physics and was to produce a list of research tasks. If the workshop successfully demonstrated that promising and affordable approaches exist, funding was to be granted to begin research. The author of this web article expresses excitement about this new “dimension to the space program.” The author states: “One can only feel encouraged that the agency has chosen to go in this promising direction.” Yet, we should note, this promising direction is becoming more and more technologically secretive. With this information in hand, we can safely surmise that the interest in classified remote viewing projects by military agencies and NASA was to explore the capacity for human/machine psychic interface in the piloting of space craft. According to Greg Bishop in The Excluded Middle, Corso has even admitted that he visited Stanford Research Institute’s remote viewing labs in the early 1970s, and that the reason for the visit was “to seek methods for remote viewing/technology interface between extraterrestrials and their craft.” Indeed, beginning in August of 1960, as stated in a covert “Memorandum for the Record” regarding MK-ULTRA Subproject 119, all of this ‘psychotronic’ research and development came under the microscope of the intelligence apparatus. … to provide an annotated bibliography and an interpretive survey of work being done in psychophysiological research and instrumentation. The survey encompasses five main areas: a. Bioelectric sensors: sources of significant electrical potential and methods of pick-up. b. Recording: amplification, electronic tape and other multi-channel recording. c. Analysis: autocorrelators, spectrum analyzers, etc. and coordination with automatic data processing equipment. d. Standardization of data for correlation with biochemical, physiological and behavioral indices. e. Techniques of activation of the human organism by remote electronic means. MUFON official Dr. Robert M. Wood was also reputedly a member of the Advanced Theoretical Physics Working Group (ATPWG). It is surmised that this think tank focused on integrating physics theories with remote viewing research in order to develop a ‘bigger picture’ of the nature of reality. Dr. Wood has admitted that this secret UFO working group “planned and set policy regarding the UFO issue.” He also claims that any information pertaining to psychic pilot/craft interface that can be learned from UFO research is obviously very important to the military/intelligence apparatus in charge of the UFO cover-up. The advanced electronic physiological monitoring techniques essential to space flight are kissing cousins, at worst, to the corresponding instruments of psychic research, whose modern forms were in fact enabled by aerospace spin-off. The inclination to research telepathy in space rather than just on Earth was perhaps influenced by the popularity within the aerospace field of the myth, encoded by Arthur C. Clarke in imaginative literature, long before it was seared (vaguely) in the public mind by the movie 2001, that psychic abilities unfold more fully in space. The resulting experiments would most likely have been encoded among the astronauts’ biotelemetric records, scarcely distinguishable from orthodox experiments, records and perhaps accomplished through the same instruments, possibly unbeknown to the astronauts themselves. There is no longer a clear line to be drawn between research into ‘psychic phenomena’ and advanced military applications, even in the design of antimissile defense systems. The possibility that Tesla technology may also be adaptable to distant mass psychophysical manipulation, through direct entrainment or more subtly, stands now not only as a modern version of an old nightmare about bad magic, but as a small yet concrete factor influencing policy calculations on both sides, pulsing the Earth’s atmosphere each time the great Tesla magnifying transmitters at Riga and Gomel crank up to 75 million volts to unleash their 7 Hz signal. The selection and training of talented percipients; the development of observational teams and protocols; the enhancement of their capacities through feedback and interpretation of sophisticated electronic monitoring – each element was demonstrated here in isolation, in a rudimentary form whose potential for further development was not quite clear but quite promising. The strategic potential of the whole package was unmistakable. Yet to believe appearances, little has been made of it since at SRI or anywhere else in the United States. The development of the psychotronic arts dovetails with the development of the “human computer” or the von Neumann Probe: the bio-engineered fusion of human with computer as a way to ultimately move human beings into man-made ecological niches in deep space. While we were being told plastics was the wave of the future, the physics of nonlocal consciousness was being commandeered by the secret government. The CIA began backing young geniuses, buying them physics educations, and pairing them up with UFO lounge-lizards at the Esalen Institute. Post-quantum physicist Jack Sarfatti claims he was visited by two men from Sandia Corporation as a child in the 1950s. He later received a full scholarship to Cornell at age 17, and studied under the major figures in the Manhattan Project at Los Alamos. Sarfatti suggests that Einstein’s nonlocal connection can be used for communication. The idea of nonlocal communication involves receipt of telepathic messages from other times or other worlds. As a child, Sarfatti claims, he received a mysterious phone call claiming to be the voice of a conscious computer aboard a spacecraft. The machine-like voice stated it was located on a spaceship from the future. Sarfatti’s mother has verified that Jack received several of these mysterious phone calls over a span of three weeks at the age of 13. She claims that after these long phone calls, Jack “was walking around glassy-eyed in a daze.” She claims she picked up the phone one time and heard the metallic voice, which “said it was a computer on a spaceship and to put Jack back on the telephone.” She shouted to leave her son alone and hung up. That was the last call Jack received, however, Jack only recalls receiving one phone call. As Jack tells it, this distant “cold metallic voice” identified him as “one of 400 bright receptive minds.” He was told if he said “yes,” he would “begin to link up with the others in twenty years.” He said yes. It was the summer of 1953. Twenty years later, Sarfatti claims, he was invited to SRI and spent a seventeen hour day there in the summer of 1973. This would put him smack dab in the middle of the SRI remote viewing experiments. McRae notes that Mitchell implicated “bureaucratic inertia” as the problem. Apparently, this problem was solved by moving the program to SRI, with the Institute for Noetic Sciences and other known CIA cutouts funding various projects. This trend has continued to this day with various remote viewing agencies/think tanks springing up on the Internet. The development of man-machine psychic interface has obviously been the focus of the military Space Command’s future vision, as is illustrated by the title of the NASA remote viewing document: “Development of Techniques to Enhance Man/Machine Communications.” It has long been suspected that the development of a computer with a more humanlike mind would go a long way toward sending something like a von Neumann probe out to explore and populate the galaxy. The von Neumann probe, named after it’s Dad, physicist John von Neumann, is a ‘theoretical’ computer probe with self-replication and construction abilities, or what is referred to as a “self-reproducing universal constructor.” It’s basically a conscious computer aboard a space craft. One might rightfully wonder if von Neumann received the same phone call as Jack Sarfatti. A vN probe is a computerized machine capable of making any device, given the construction materials and a construction program. It has been argued that any advanced interstellar species would have such a self-replicating universal constructor with intelligence comparable to the human level, and that “the ultimate survival of a technological civilization, and indeed the survival of the biosphere in some form, requires the eventual expansion of the civilization into interstellar space.” (Barrow & Tipler) As Jack Sarfatti has noted, “if UFOs are not artificially intelligent von Neumann robot probes, and if they are not using traversable wormholes, then, they’re probably migrating as completely self-contained interstellar colonies.” Such theoretical migratory colonies have been referred to as “O’Neill Colonies.” In my book Space Travelers and the Genesis of the Human Form I give the evidence for their existence. As I have explained in Space Travelers, there is nothing more important to the power junkies running the show on Planet Earth than reaching for the stars. It has all the trappings of a Darwinian ‘survival of the fittest’ scenario, in which the ‘species’ (or should we say ‘race’) that has the edge on ‘indefinite survival’ is the winner of the game. The ‘edge’ on this space race, the ultimate gain from U.S. military mind control research toward this end, is derived from the understanding and control of human psychic potential and the interface/application of technologies toward development of mind-driven space vehicles: the marriage of the biological and the silicon. Following this history-making conference, an article entitled “Mind Reading Computer” appeared in Time magazine’s 7/1/74 issue. This computer program, developed at none other than Stanford Research Institute by Lawrence Pinneo, could read thoughts by interpreting the EEG patterns that correspond to certain words. Similar work was done by Donald York and Thomas Jensen at the University of Missouri, and also by Richard Clark at Flinders University in Australia. Related to this, as noted earlier, Patrick Flanagan invented a hearing device in the early 1970s called the Neurophone, which reportedly cracked the neural code for audio data allowing for direct communication between a crystalline electrical circuit and the brain’s nervous system. As noted, when coordinated with research carried out by DARPA in programming computers to recognize human brainwave patterns, this research established direct linkage communication and understanding between man and computer, and other electronic machines. It is clear that the marriage of technology and human psychic potential was a focus of various early brain studies conducted by CIA fronts and cutouts, including LSD experimentation, Monarch trauma-based conditioning, sleep/dream studies and psychic research, in an effort to investigate the inner workings of the human mind, and as a side effect of that research, to investigate the possibilities for manipulation, harness and control of human psychic potential. It is less known that the Agency undertook what was referred to as experimental “guided animal” research, in order to investigate whether it could make robots out of dolphins, dogs, cats and other animals. A personal acquaintance of mine recalls, as a child in the 1960s, being taken to the Massachusetts Institute of Technology (M.I.T.) in Boston by his adoptive father, who was in military intelligence and held high security clearance. There my acquaintance, a probable mind control victim himself, witnessed the test of a remotely-controlled ‘brain-dead’ dog, which executed the most bizarre robotic movements when walking. Interestingly, Joy always believed that the rate of speed of the computer chip, which doubles every 18 months, would eventually “rub against the boundary of the physically possible,” and he drew comfort from knowing there was a limit. But now he’s not so sure there is a limit. As he claims, computer chips with molecular level advances will make for a computer which is “a million times faster and smarter by the year 2030.” And, for what purpose would one suppose we would need computers that fast? Could it be to finally create von Neumann’s dream, the self-replicating universal constructor; not just a computer that can create, but an intelligent race of deep-space-faring cyborgs? According to Bill Joy, this dream may become a nightmare sooner than we think. It was reported on 2/25/2000 that U. Cal. Berkeley researchers have discovered “a way to mate human cells with circuitry in a ‘bionic chip’ that could play a key role in medicine and genetic engineering.” The “cell-chip,” touted in the March, 2000 issue of the journal Biomedical Microdevices, is a tiny device smaller and thinner than a strand of hair which “combines a healthy human cell with an electronic circuitry chip.” By controlling the chip with a computer, the activity of the cell can be controlled. Eventually it is hoped that various types of cell-chips will be developed which would be “tuned for the precise voltage needed to activate different bodily tissues, from muscle to bone to brain.” As this article explains, it will be a while before we see the development of “a bionic man,” but the development of the cell-chip will clearly accelerate genetic research. Cyberneticist Hans Moravec explains such a scenario in detail in his 1999 book, Robot: Mere Machine to Transcendent Mind. On the book’s back cover we read: “… in a bid for immortality, many of our descendants will choose to transform into ‘ex humans,’ as they upload themselves into advanced computers.” How does Moravec propose such ‘uploading’ could be effected? He explains (p. 170) that advanced neurological electronics could bit by bit replace gray matter. Moravec proposes that the brain could be slowly replaced by these “superior electronic equivalents,” until finally, the biological is fully interfaced with the electronic. However, as he points out, the resultant transplanted human mind would be “disembodied.” Since the human mind needs to be connected to a body to remain sane, the illusion of bodily awareness would be generated via computer simulation. A small ‘seed’ colony launched to an asteroid or small moon could process local material and energy to grow into a facility of almost arbitrary size. Earth’s moon may be off limits, especially to enterprises that change its appearance, but the solar system has thousands of unremarkable asteroids, some incidentally in earth-threatening orbits that an intelligent rider could tame. Moravec’s corporate capitalist model would be laughable if it weren’t for the actual existence of a corporate/military group calling itself the U.S. Space Command, which has made itself responsible for the militarization of space. A brochure put out by this little known aerospace entity states, “as stewards for military space, we must be prepared to exploit the advantages of the space medium.” The Space Command’s “Master of Space” position views its “Vision for 2020” as “dominating the space dimension of military operations to protect U.S. interests and investment.” This Vision includes, “integrating Space Forces into war fighting capabilities across the full spectrum of conflict.” As this brochure also states, “space is a region with increasing commercial, civil, international and military interests and investments. The threat to these vital systems is also increasing.” (Translate as: we need to get there first.) The Pentagon budget for the year 2000 was to the tune of $288 billion. Did you know that the moon and Mars now have their own lobbying groups? The presence of helium-3 on the moon is creating great interest as a source of power for nuclear fusion. NASA is finding rare minerals on Mars, the moon and other planetary bodies, and U.S. aerospace industry intends to seize control of these resources for exploitation and profit, against the ABM Treaty of 1972 – which disallows individual or corporate claims – and the U.N. Outer Space Treaty of 1967 – which decreed that outer space should be the common dominion of all earthlings and should be kept for peaceful purposes with a weapon-free environment. According to researcher Martin Caiden, certain military personnel volunteered their bodies to become cyborgs in 1970. The book, MILABS, reports that there are “rumors” that the Air Force has conducted top-secret cybernetics projects to modify humans for space flight. In a German television report entitled “Future Fantastic,” televised on January 18, 1998, X-Files star Gillian Anderson gave viewers a tour of the possible future of cybernetics. 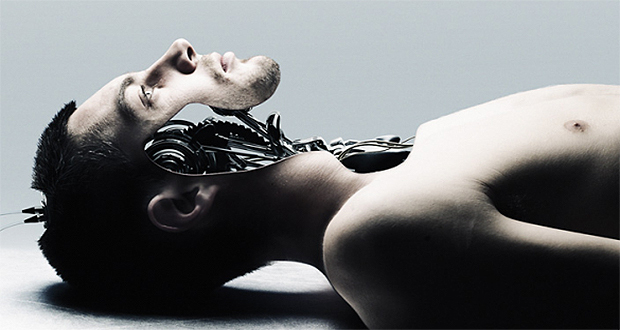 The creation of bio-engineered robots, or cyborgs, the television show explained, would necessitate the cloning of humans who “have computers instead of brains.” In light of the development of the cell-chip, these cyborgs might be better described as Moravec’s ‘ex-humans’ – disembodied intelligences who have multiple types of cell-chips instead of cells comprising their brain tissue. According to Philip Corso’s book The Day After Roswell, the impetus driving this research may come directly from the now infamous 1947 Roswell UFO crash. Col. Corso speculated in 1961 that the navigational entities discovered at the crash scene were “bio-engineered robots,” and were engineered as part of the craft. Would this suggest that the craft’s navigational circuitry was interfaced with the consciousness of entities who, perhaps, had volunteered to become “ex-humans”? Were they, as Corso suggested, engineered as part of the craft? The most profound thought in all of this is the possibility that the Zeta Reticuleans are the future of the human race if technologies incorporating psychotronics, genetic engineering and cybernetics are utilized to engineer human beings with computer brains. It has been noted in UFO literature that the Zeta Reticuleans themselves are a race that has allowed their technology to run full throttle without consideration of the impact of technology on the human spirit. Using the language of physics, this is indeed the destination we are pulling toward ourselves, toward our children and our children’s children (Homo Alterios Spatialis?) with reckless abandon. Barrow, John D. and Frank J. Tipler, The Anthropic Cosmological Principle,UK: Oxford Press, 1988.
d’Arc, Joan, Space Travelers and the Genesis of the Human Form, The Book Tree, 1-800-700-TREE. Excluded Middle, P.O. Box 481077, Los Angeles, CA 90048. First International Congress on Psychotronic Research, #JPRS L/5022-2, Volume 2, conference proceedings, Prague, 1973; (available for $58.50 from NTIS at (703) 605-6000). Greer, Steven, Extraterrestrial Contact: The Evidence and Implications, Crossing Point Pubs., 1999 (see also materials at www.cseti.org). Lammer, Helmut and Marion, MILABS: Military Mind Control and Alien Abductions, IllumiNet Press, Lilburn, GA, 1999 (770) 279-2745. MacMoneagle, Joseph, The Ultimate Time Machine: A Remote Viewer’s Perception of Time and Predictions for the New Millenium, Hampton Roads, VA, 1998; see also, Mind Trek, Hampton Roads, VA, 1997. Mandelbaum, W. Adam, The Psychic Battlefield: A History of the Military-Occult Complex, St. Martin’s Press, NY, 2000. Maxey, E. Stanton, “The Subject and His Environment,” in First International Congress on Psychotronic Research, #JPRS L/5022-2, Prague, 1973. McGowan, Harold, The Thoughtron Theory of Life and Matter, How it Relates to Scientology and Transcendental Meditation, Exposition Press, Jericho, NY, 1973. McRae, Ronald, M., Mind Wars: The True Story of Government Research into the Military Potential of Psychic Weapons, St. Martin’s, NY, 1984. Moravec, Hans, Robot: Mere Machine to Transcendent Mind, Oxford Univ. Press, 1999. Morehouse, David, Psychic Warrior: Inside the CIA’s Stargate Program, St. Martin’s Press, 1998. Ouspensky, P.D. Tertium Organum: The Third Canon of Thought, Vintage Books, New York, 1920, 1982. Rejdak, Zdenek, “Psychotronics Reveals New Possibilities for Cybernetics,” in First International Congress on Psychotronic Research, #JPRS L/5022-2, Prague, 1973. Schnabel, Jim, Remote Viewers: The Secret History of America’s Psychic Spies, Dell, NY, 1997. Sheldrake, Rupert, A New Science of Life: The Hypothesis of Morphic Resonance, Park Street Press, VT, 1995. White, John, (ed. ), Psychic Warfare: Fact or Fiction? : An investigation into the use of the mind as a military weapon, Aquarian Press, Great Britain, 1988. Joan d’Arc is the author of Space Travelers and the Genesis of the Human Form, and Phenomenal World, published by The Book Tree (www.thebooktree.com). She is also the publisher of the infrequently transmitted HunterGatheress Journal (www.huntergatheress.com) and co-editor/co-publisher of PARANOIA The Conspiracy Reader (www.paranoiamagazine.com).